Big League Chew bubble gum . Shredded bubble gum in stay fresh foil packages. a softy and chewy shredded bubble gum, the only of it's kind. Just open the foil pack and grab as much or a little as you want. 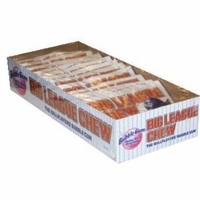 Big League Chew bubble gum is also known as the baseball player's chewing gum.